I am back with another giveaway... but before the giveaway I will be introducing you all to a facebook page called the Sammydress Promotion. The lovely members of Sammydress has launched this facebook page to introduce you all the new program called iTry. iTry is as Free Sample Page and anyone/everybody could join and apply now!! You don't need to be a blogger or even a youtuber, all you need is to love fashion and clothes. "Simple & sweet -right" All you need is a facebook account, just click on iTry free sample and you are officially in! How to join iTry I--Mystyle? Fill & sumbit the application form on the facebook page, and the member of iTry will contact you asap. What you will receive? Dresses, jewelery, shoes, handbags They will send you whatever you like from their website SammyDress.com valued from $15 to $200. What do you need to do? Just share your style show! Show it at Lookbook! If you have a blog (great - but you don't really need one). Just remember to post the look on their facebook wall. To get your Free Sample to do the cheap & chic fashion shows! Let's show us see your style! https://www.facebook.com/pages/Sammydress-Promotion/372299856172559?v=app_208195102528120 So, go check it out right now and join them! Remember to each of us has a unique sense of style, that's what makes up all different. Instead of hiding it, you should share you sense of style with the world.! Well, I have team with up SammyDress.com to host a giveaway with not one but two winners!! Yes you heard it right, you of my lucky readers will get to choose a dress of their own from SammyDress.com. Summer is behind us now, and Fall and Winter styles are on the way. It’s time to start shopping again ladies!! SammyDress.com has so many stylish pieces for amazing prices!! 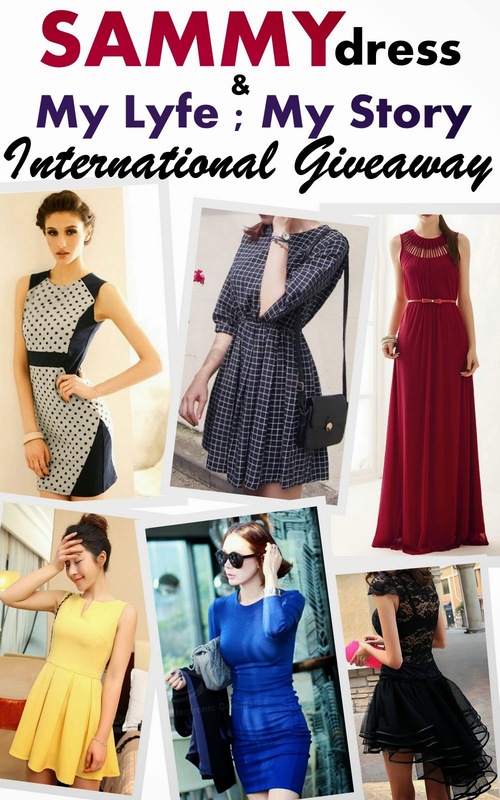 As a thank you to all my lovely readers, I have teamed up with SammyDress.com and this time this giveaway will be held for three weeks so it will end on Nov 12. So, there is tons of time for all of you to enter and also the top twelve entries will get a small surprise for another contest coming soon. So, good luck everyone!! Good Luck and remember this is an international giveaway!! Plus two winners!! Also remember I am hosting another two more giveaways as well!! Have a great Tuesday people! !